At Acme, we pride ourselves on offering our customers real value in the form of long lasting high quality sponge products. Products that help get the job done right the first time. Acme products are the finest products made from the finest materials in the world, and we stand behind them. Although we offer a variety of products for different jobs and applications, they can be divided into two primary categories of products, natural and synthetic. 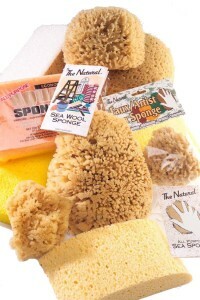 Acme offers both natural and synthetic sponges. Although Sea Sponges have many advantages over synthetic sponges, they are not right for every application. Natural sponges are some of the most versatile tools available, and have been used for millennium by people all over the world. And from the different varieties harvested for use, we have chosen to offer those that are most useful and durable. Sea Sponges are an environmentally-friendly, non-toxic, hypoallergenic, 100% biodegradable, quickly renewable natural resource that is sustainably harvested from the ocean. Natural sea sponges, unlike artificial sponges, naturally inhibit the growth of bacteria, will not stain or retain odors, and are very economical. The Sea sponge’s soft texture promotes a less abrasive and more thorough cleaning than synthetics, are more absorbent, more durable (unless exposed to harsh chemicals) and longer lasting. Our synthetic sponge products have been developed for those types of applications that natural sea sponges would not work as well for. And because we recognize the need to have the right tool, or sponge, for the right job, we have developed a line of both cellulose and polyester sponges. Synthetic sponges, which are sponges made through a combination of chemical process, are a better choice for certain types of jobs. Because they are more resistant to harsh chemicals, they are better suited to many construction jobs, such as masonry, drywall, tile and grout, texturing, and general cleaning where bleach or other harsh chemical cleansers are needed. We guarantee the satisfactory performance of our natural sponge and chamois products; and we do it in writing on our labels. Any natural chamois or sponge product found to be defective will be replaced free of charge by Acme Sponge and Chamois Co. Replacement will be made upon presentation of product, proof of purchase, package and explanation of dissatisfaction.